The official signing ceremony of the framework agreement for the establishment of Fraunhofer Project Center for Composites Research took place at UNIST. From left are Frank Henning (Deputy Director, Fraunhofer ICT), UNIST President Mooyoung Jung, Mayor Gi-Hyeon Kim of Ulsan, Yong-Rae Kim (Direct General for Industrial Technology Policy, MOTIE). Taking a seat at the cutting edge of innovation in the automotive sector. Today’s automotive industry is rapidly shifting towards lighter weight designs and materials to improve vehicle fuel economy. In fact, the key to improve a vehicle’s energy efficiency is the use of lightweight materials in vehicle manufacturing and this is why composite materials are widely used in car bodies, these days. 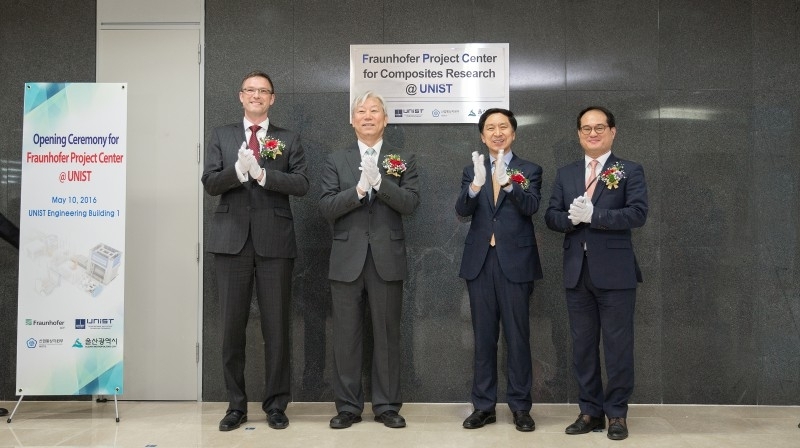 The Fraunhofer Institute for Chemical Technology ICT, Europe’s biggest research and development organization, and the Ulsan Institute of Science and Technology (UNIST) in Ulsan, South Korea will work together on developing and processing composite materials for lightweight and eco-friendly vehicles. In the morning of May 10th, the official signing ceremony of the framework agreement for the establishment of Fraunhofer Project Center for Composites Research took place at UNIST. With the official launch of a Korean branch of Germany’s Fraunhofer research group, the City of Ulsan will become South Korea’s first supporter of this exciting initiative. 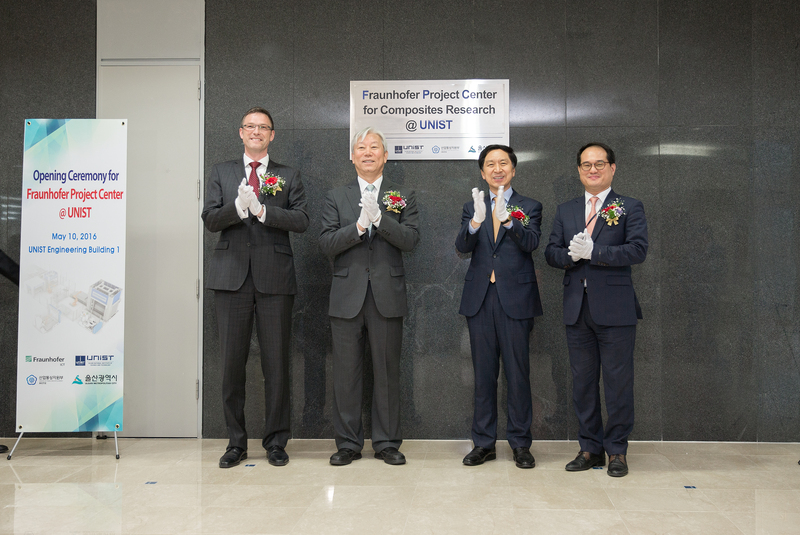 The Fraunhofer Project Centre (FPC) for Composites Research@UNIST (FPC@UNIST) represents a unique and unprecedented partnership bringing together a Korean university, a German industry, and Korean government. The official signing ceremony of the framework agreement for the establishment of Fraunhofer Project Center for Composites Research took place at UNIST on May 10th, 2016. Following Canada, this is the second branch that has been approved by the headquaters of the Fraunhofer-Gesellschaft. Along with the Canadian branch, this new Korean branch of Fraunhofer will play an important role as the stronghold for the Fraunhofer Institute for Chemical Technology (ICT). Located on UNIST campus, this new project center will be headed by Frank Henning, Deputy Director, Fraunhofer Institute for Chemical Technology (ICT). The center will focus on developing lightweight composites at this testing-ground facility through full industrial-scale trials. 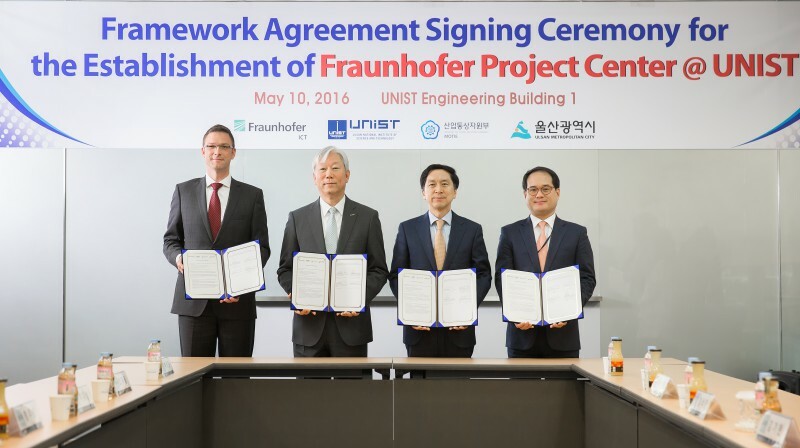 The City of Ulsan expects that this partnership with the Fraunhofer ICT will allow UNIST to take a seat at the cutting edge of innovation in the automotive sector.